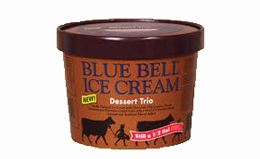 blue bell Archives | Food blog! What are the flavors of Breyers ice cream? In 1866 William Breyer produced his first gallon of ice cream. The first Breyer’s retail change opened in 1882, and quickly expanded, growing in size and flavors until we have quite a comprehensive list of tasty choices…. Breyers claims that, in addition to their Natural ice cream, their Smooth & Dreamy and Double-Churn fat free icecreams do not sacrifice any of the flavor of the natural versions. Chekc out some Blue Bell ice cream flavors.